Heinlad usually acts dazed and vague. He has a clock in his stomach, which gives him the ability to manipulate time. His super-secret skill is being able to stop or stretch time for a limited duration, but there's a flaw in this ability: he still can't control it at will. Heinlad's past and combat abilities are surrounded in mystery. Robot Mode: First off, Heinrad is a pretty big figure. Figures created exclusively for the Japanese market don’t usually follow the size classes of their American counterparts, but I’d call Heinrad a large Voyager, bordering on Ultra. He’s powerfully built, too, giving the impression of having an abundance of muscles. And while it’s obvious that he transforms into some kind of furred animal, you don’t really see much in the way of identifying characteristics on him, at least from the front. There is, of course, the big clock face on his torso. And before anyone asks: it’s a working clock. A single AAA battery starts it ticking and it even comes with an alarm. You can set the alarm by pulling up his head and shut it off by pushing it down (the alarm only works in robot mode). So take that Chrono Label figures, Heinrad was the first working clock Transformer. Anyway, while the clock is, of course, very obvious, it doesn’t take anything away from the figure, neither in terms of looks nor posability. Speaking of posability, Heinrad has the full range of movement one can expect from a Beast Wars figure, meaning pretty damn good. He’s a bit top-heavy because of the clock mechanism, but has no problems with all sorts of poses. His feet, especially his heel spurs, could have been a tad bigger to give him a more stable stance, but he does pretty well with the feet he has, too. My favourite part of this figure is the head, though. An awesome sculpt, very nicely done, and with an additional gimmick that allows Heinrad to slide green goggles over his eyes for targeting purposes or whatever. Really nice. As a weapon the figure carries a big rifle / missile launcher, combined from the two items he carries in beast mode (see below). Not the best weapon ever, but good enough. So all in all, a great robot mode with only very minor things that could have been improved. Thumbs up. Beast Mode: Heinrad transforms into a Tanuki, a creature from Japanese folklore somewhat resembling a racoon (actually the so-called Japanese Racoon Dog or Nyctereutes Procyonoides Viverrinus for the Latin-lovers among us). The Tanuki carries both a bottle of sake (they apparently drink a lot) and a book with the names of people it has tricked into giving it money (Tanukis are not nice folklore creatures, apparently). The two items combine into his robot mode weapon. Also, Tanukis are apparently known for having very large testicles that they drum on (doesn’t that hurt?). So this toy figure meant for children actually has testicles, yes. Though they are depicted as small grey blocks and only their position between Heinrad’s beast legs reveals them as what they are supposed to be. His arms aren’t long enough to drum on them, though, so that’s a relief. Heinrad’s spark crystal is also on one of them. Make of that what you will. The clock is now on Heinrad’s belly, but it doesn’t really make much of a difference. The arms are the same as the robot mode arms, while the legs are much shorter and he has a tail, too. Very nice surprise: the head, despite being formed from two halves that rest on Heinrad’s shoulders in robot mode, is actually posable. Not fully, but the Tanuki can look upwards, left and right. Nicely done. The detailing on the animal head is also very nice. So all in all a very strange choice for a beast mode, but nicely implemented. No complaints. 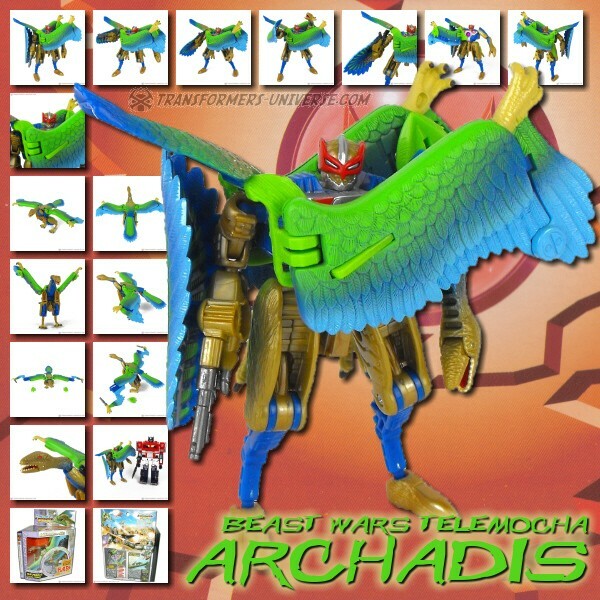 Remarks: Beast Wars Neo was a Japanese exclusive spin-off series of Beast Wars and filled with strange beast modes. We had a mammoth, a giraffe, a penguin, and we have this Japanese folklore creature best known for its giant testicles. Having a clock face on his torso, Heinras had time powers of course. In the cartoon and comic he could freeze time, while the IDW Beast Wars profile book made him a time traveller that would occasionally just flicker out of existence, not having perfect control over his abilities. Either way, the figure itself is superb and if you ignore the background of the beast mode, there is no problem there, either. The fact that it’s a working clock is little more than a bonus, but a nice one. So bottom line: recommended to all Beast Wars fans.